To Cite: Aramouny E, Sacy R, Chokr I, Joudy B. Local Validation Study for NutricheQ Tool in Lebanon, J Compr Ped. 2018 ; 9(1):e63573. doi: 10.5812/compreped.63573. Background: Globally, there is a trend towards consumption of energy-dense, nutrient-poor foods leading to dietary imbalances in toddlers. Nutrient deficiencies are associated with the risk of obesity and other health risks. NutricheQ is an 18-item questionnaire that can quickly identify these risks based on dietary patterns in healthy toddlers. Objectives: This study aimed to validate the NutricheQ tool, describe the dietary intake of toddlers and classify them into risk groups. Methods: This was a national, multi-center, observational, validation study conducted at 21 medical centers in Lebanon. Data was collected from NutricheQ administered to the parents of toddlers during a single outpatient visit, and food diary filled by parents during a 4-day follow-up. The validation process of NutricheQ was done using Pearson’s and Spearman’s correlation, ANOVA and ANCOVA. 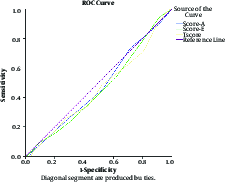 The accuracy of NutricheQ in the Identifying categories of nutritional risk was evaluated using the receiver operating characteristic (ROC) curves. All analyses were performed using IBM-SPSS version 24 and P value of ≤ 0.05 was considered to be statistically significant. Results: Of the 487 toddlers enrolled, 467 had full data on NutricheQ and food diary data was available for 247 only. Majority of toddlers in Lebanon (80% - 88%) were categorized in the moderate or low-risk groups of dietary intake indicating good eating habits. There was a significant positive association between the total NutricheQ score and both, age (r = 0.11, P = 0.021) and BMI Z-score (r = 0.11, P = 0.021). ROC fitting showed a very low discriminatory ability of the scores to correctly classify toddlers into the high-risk group based on their BMI Z-score. Significant positive correlation was obtained between the NutricheQ total score and exchangeable fat and meat with high fat, in the food diaries (R = 0.170, P = 0.045), indicating risk. Also, there was a negative association between the total NutricheQ score and soluble and insoluble fiber (Rs = 0.181, P = 0.004). Conclusions: Results from this study showed that NutricheQ has reasonable validity in the Lebanese context to assess the dietary quality of toddlers in Lebanon and in identifying those at increased nutritional risk. Nutrition screening involves identifying ‘any inappropriate dietary pattern that may impair health’ (1) which includes both over- and under-nutrition, and therefore identifying individuals who are in need of further nutrition assessment, and potentially intervention (2). Toddlers, in particular, are vulnerable to the dietary risk as they begin to exert their independence with food choices and some demonstrate fussy eating behaviors (3). Also, dietary risk habits may persist over time (4) and influence short- and long-term health (5). Consequently, early nutritional risk identification is critical among that age group. Data from several countries highlights a trend worldwide; an increased number of toddlers are consuming energy-dense, nutrient-poor items, and less fruit and vegetables on a regular basis (6, 7). Toddlers’ dietary patterns are not consistent with dietary guidelines thus, placing them at risk of deficiencies and morbidities later in life. Literature shows that the Lebanese population is abandoning the traditional diet and replacing it with more westernized dietary habits, mainly fast food and snacks (8). These processed foods are high in sugar, fat, and proteins. Thus a high amount of these nutrients is incorporated in the diets. Overweight, obesity and iron deficiency have been identified as the main nutritional issues among infants and toddlers (9, 10). Limited data are available on the dietary habits of toddlers in Lebanon, to have a deeper understanding of their dietary habits. There is an unmet need to screen toddlers’ dietary intakes against current dietary guidelines to identify those at risk. Thus, a timely, valid assessment of dietary intake of infants is required. ‘NutricheQ’, is an 18-item questionnaire developed by Danone Nutricia early life nutrition based on suggestions from family pediatricians, the user-requirements of European nutrition experts, and evidence from state-of-the-art literature (11) to provide a reliable and valid means of assessing immediate or future risks associated with a toddler’s current dietary intake, dietary patterns, feeding environment and parental feeding practices. The questionnaire is divided into three main parts: dietary risks that are likely to affect current health, dietary risk factors that are likely to affect future health, check concerns that the parent may wish to raise with their health professional. NutricheQ has proven to be a valid method of quickly assessing dietary quality in preschoolers aged 12 to 36 months, and in identifying those at increased nutritional risk in a study conducted in Ireland (11). There is a lack of a validated tool to characterize toddlers’ dietary intake in Lebanon. The validation of a tool such as NutricheQ for Lebanese toddlers would allow the identification of known, evidence-based risk factors for dietary deficiencies or excesses in preschoolers aged 12 months plus, to which the parent and healthcare professional can respond. This study evaluated the validity of the NutricheQ tool among a Lebanese toddler population and identified the association of the NutricheQ scores with age, gender, weight, height, and body mass index (BMI). This was a national, multi-center, observational, validation study conducted at 21 medical centers in Lebanon. This study enrolled parents of 487 healthy toddlers (male and female) who were free from disease, took no medication, were born as full-term babies, and visited the participating physicians over the six month study period (irrespective of the clinical reason for the clinic visit). The NutricheQ questionnaire (Box 1) was administered to the toddlers’ parents who provided informed consent, during a single outpatient visit, and a risk score was generated to classify each toddler in a particular risk group. Following this, the food diary intake form (FDIF) was filled by parents of the enrolled toddlers during a four day follow up (2 days on weekdays, two days weekend) and returned to the medical centers. aEach question has three possible responses, a, b, and c with answers in the ‘a’ category having a minimum score of 0 (minimal risk) and answers in the ‘c’ category having a maximum score of 2 (indicating a potential cause for concern). The intermediate category ‘b’ was classed as ‘less than ideal’ with a score of 1. Questions 14 relate to Section 1 focusing on iron and vitamin D status, questions 511 correspond to Section 2 focusing on risk factors for other dietary imbalances, and questions 1218 relate to Section 3, which aimed to identify risk factors for longer term nutritional risk. For each section, the question responses are summed with an increased overall score indicating increased risk. As this validation study focused on Sections. Toddlers’ characteristics were summarized using means and standard deviations for numerical variables such as age and weight; frequency distributions for categorical variables such as gender and different classification of NutricheQ scores based on scores A, B, and total. Characteristics of male and female toddlers were compared using the independent t-test for age, weight. The Chi-squared test for categories on score A and B. The Z-scores, weight, height, and BMI were computed using the WHO Anthro software program for Windows, version 3.2.2) which is used in the analysis of nutritional surveys (12). The means of BMI, height, weight, and Z-scores were compared across the different categories of score A and B after adjusting for the age by using analysis of covariance (ANCOVA). Receiver operating curves (ROC) were fitted to determine if any of the scores on the NutricheQ questionnaire: A, B or total can have the ability to correctly classify toddlers into high risk according to the BMI Z score (those are defined with BMI Z-scores above +3 or below -3). The NutricheQ questionnaire was validated for a possible association between the risk scores in sections 1 and two versus the total score on the questionnaire and the average daily intake of nutrients using Pearson’s correlation. The Spearman’s correlation method was also used to decrease the effect of possible outliers and since the scores are not truly continuous in nature. The toddlers were classified into four groups based on the quartiles of the total score on the NutricheQ questionnaire. Toddlers within the higher quartile groups were considered more at risk. To ensure that the four groups are comparable by age and gender, the mean age was compared among the four quartiles using one way ANOVA with Bonferroni’s correction for multiple comparisons when needed, and the percentages of females in the four quartiles were compared using the Chi-square test. For validation, mean nutrient levels were compared between the four groups using analysis of covariance (ANCOVA) adjusting for age and using Bonferroni’s adjusted for multiple comparisons when needed. All analyses were performed using IBM-SPSS version 24. A P value of ≤ 0.05 was considered to be statistically significant. The demographic and anthropometric data were available for 487 toddlers, of these 467 had full data on NutricheQ. For the 487 toddlers, the average age was 22.2 months and, more than half were males (55.0% (268/487)). The average birth weight was 3.2 kg and height was 49.9 cm. There was average birth weight, and height of males was higher than that of the females; only height difference was statistically significant (P = 0.056 and P < 0.001, respectively). On the other hand, height Z-scores, weight Z-scores and BMI Z-scores were significantly lower for males when compared with females (P < 0.001). Overall, there was a positive association between the total score and both age and BMI (r = 0.11 P = 0.021). When stratified by gender, the association between total score and age was significant only for males (Table 1). aSignificant correlations at the 5% level. Majority of toddlers were classified as a low-risk group based on scores A and B (80% - 88% B) indicating healthy eating patterns in Lebanese toddlers. Results from the receiver operating curves (ROC) curve fitting show a very low discriminatory ability of the scores to correctly classify toddlers into the high risk group based on their BMI Z score (Area under the curve (AUC) for score A, B, and total scores are 0.474, 0.460 and 0.457 respectively) (Figure 1). Although 487 toddlers participated in this study, FDIF data was available for only 249 toddlers, and 2 FDIFs were missing. Thus the validation of the questionnaire based on the food diaries was based on the 247 toddlers who had full data on demographics, anthropometrics, NutricheQ questionnaire, and diaries. The average age of the 247 toddlers with full data as described above was 22.4 ± 6.9 months, and almost half of them were females (49.4%). The four quartiles were defined based on the total score on NutricheQ. There were no significant differences in age (P = 0.341) or gender (P = 0.514) among toddlers belonging to the different quartiles (Table 2). - Caffeine was positively associated with the score on section 2 as well as the overall score (R = 0.248, P < 0.001 and R = 0.208, P < 0.001 respectively). - The number of high-fat meats also was positively associated with the score on section 2 (R = 0.170, P = 0.045). When Spearman’s correlation was used, several nutrients were found significantly associated with the scores. - PFA20:5 was negatively associated with score on section1 and total score (Rs = -0.135, P = 0.034 and Rs = -0.153, P = 0.016 respectively). - PFA22:6 was negatively associated with score on section 2 and total score (Rs = -0.126, P = 0.048 and Rs = -0.129, P = 0.042 respectively). - Fluoride was positively associated with score on section1 and total score (Rs = 0.172, P = 0.007 and Rs = 0.127,P = 0.046 respectively). - Chromium was also positively associated with the total risk score (Rs = 0.153, P = 0.016). - Molybdenum was positively associated with risk score on section 1 (Rs = 0.130, P = 0.040). - The soluble fiber was negatively associated with the score on section 2 and the total score (Rs = 0.181, P = 0.004 and Rs = -0.137, P = 0.031 respectively). Similar results were also observed for insoluble fiber. - Lactose was positively associated with risk score on section 1 (Rs = 0.151, P = 0.017). - Lysine was negatively associated with risk score on section 2 (Rs = -0.127, P = 0.046). - Caffeine was positively associated with the score on section 2 as well as the overall score (R = 0.216, P = 0.001 and R = 0.173, P = 0.007 respectively). - Fat was positively associated with the total score (R = 0.148, P = 0.039). When comparing the mean levels of nutrients among the four groups, only vitamin D, iodine, caffeine and exchanges meat high fat showed significant differences (Table 3). In particular, toddlers in the 3rd Quartile of the total score had a higher mean vitamin D and iodine than those in Quartile 4 (195.01 vs. 125.31 IU, P = 0.021 and 24.25 vs. 13.05, P = 0.004 for vitamin D and iodine levels respectively). Toddlers in Quartile 4, had higher average levels of caffeine than those in Quartiles 1 and 3 (3.24 vs. 1.62, P = 0.005 and 3.24 vs. 1.73 P = 0.041, for comparisons with quartiles 3 and one respectively). Also, the average exchanges-meat-high fat was higher in Quartile 3 toddlers when compared with Quartile 2 (1.03 vs. 0.69, P = 0.022). Results from this study revealed that a very small proportion of toddlers were categorized into the increased risk group based on scores A and B respectively (12.2% with score A and 18.2% with score B). Thus, the majority of toddlers in Lebanon (between 80% - 88%) are categorized in the moderate or low-risk groups of dietary intake indicating good or considerably good eating habits. There was a significant positive association in particular between the total NutricheQ score and, age and BMI Z-score. This means that toddlers with higher BMI Z-scores tend to have a higher NutricheQ score, indicating risk. This trend remains the same when data is stratified by gender. This is an indicator that the NutricheQ tool is capable of reflecting toddlers BMI Z-scores. Moreover, the results from the ROC curve fitting show a low/moderate discriminatory ability for the scores to correctly classify toddlers into the high-risk group based on their BMI Z-score. This finding was strengthened when significant positive correlations were obtained between the NutricheQ total score and exchangeable fat and between section 2 of the questionnaire and exchangeable meat with high fat among toddlers whose food diaries were obtained. This indicates that toddlers who tend to eat more fat (including fat coming from meat) tend to score higher on the questionnaire, indicating risk. On the other hand, the significant negative association between soluble and insoluble fiber and the total NutricheQ score and the score on section 2 might be indicative that toddlers who consume fewer vegetables and fruits tend to have a higher NutricheQ score, indicating risk. This study did not find any association between several nutrients and the scores on the questionnaire as in the Irish and Italian cohort 11. A possible explanation is that the completion of the food diaries by the mothers or caregivers might not be very accurate. Because the toddlers could be fed by a group of people such as nannies, grandparents, daycare workers and not the parents only. Since this study was a national, multi-center, observational validation study; results reported from this study can be readily generalized to the whole toddler population in Lebanon. This study was sponsored and funded by Danone Nutricia, Lebanon. All authors participated in the development of this manuscript and approved the final manuscript for publication. The authors thank Maya Khouri, Chief Dietician at St. Georges hospital for her valuable contribution and Clinart MENA for study monitoring, clinical data management, data analysis and report writing, and manuscript writing services. The authors also thank the following investigators for their participation in this study: Alia Aaraj, Chawki Hammoud, Zeinab Tahch, Rami Mohsen, Imad Chocor, Bassem Abou Merhi, Fadi Chamesddine, Akram Dandach, Julien Lteif, Raymond Kamel, Antoine Farah, Georges Aramouny, Rony Sayad, Khaled Makki, Bassam Ghanem, Michel Khoury, Joseph Rachkidi, Ghaiss Makhoul, Maha Abou Alfa and Bilal Dhayni. 1. Dietary risk assessment in the WIC program. Washington, DC: National Academy Press; 2015, [cited 22 June]. Available from: http://www.nap.edu/openbook.php?isbn=0309082846. 2. Charney P. Nutrition screening vs nutrition assessment: how do they differ? Nutr Clin Pract. 2008;23(4):366-72. doi: 10.1177/0884533608321131. [PubMed: 18682587]. 3. Dovey TM, Staples PA, Gibson EL, Halford JC. Food neophobia and 'picky/fussy' eating in children: a review. Appetite. 2008;50(2-3):181-93. doi: 10.1016/j.appet.2007.09.009. [PubMed: 17997196]. 4. Skinner JD, Carruth BR, Bounds W, Ziegler P, Reidy K. Do food-related experiences in the first 2 years of life predict dietary variety in school-aged children? J Nutr Educ Behav. 2002;34(6):310-5. doi: 10.1016/S1499-4046(06)60113-9. [PubMed: 12556269]. 5. Owen CG, Martin RM, Whincup PH, Smith GD, Cook DG. Effect of infant feeding on the risk of obesity across the life course: a quantitative review of published evidence. Pediatrics. 2005;115(5):1367-77. doi: 10.1542/peds.2004-1176. [PubMed: 15867049]. 6. Chan L, Magarey AM, Daniels LA. Maternal feeding practices and feeding behaviors of Australian children aged 12-36 months. Matern Child Health J. 2011;15(8):1363-71. doi: 10.1007/s10995-010-0686-4. [PubMed: 20872057]. 7. Whitton C, Nicholson SK, Roberts C, Prynne CJ, Pot GK, Olson A, et al. National Diet and Nutrition Survey: UK food consumption and nutrient intakes from the first year of the rolling programme and comparisons with previous surveys. Br J Nutr. 2011;106(12):1899-914. doi: 10.1017/S0007114511002340. [PubMed: 21736781]. 8. Batal M, Hunter E. Traditional Lebanese recipes based on wild plants: an answer to diet simplification? Food Nutr Bull. 2007;28(2 Suppl):S303-11. doi: 10.1177/15648265070282S209. [PubMed: 17658076]. 9. World Health Organization . Obesity and overweight. 2016. Available from: http://www.who.int/mediacentre/factsheets/fs311/en/. 10. World Health Organization . Guidelines on food fortification with micronutrients. 2017. Available from: http://www.who.int/nutrition/publications/guide_food_fortification_micronutrients.pdf?ua=1. 11. Rice N, Gibbons H, McNulty BA, Walton J, Flynn A, Gibney MJ, et al. Development and validation testing of a short nutrition questionnaire to identify dietary risk factors in preschoolers aged 12-36 months. Food Nutr Res. 2015;59:27912. doi: 10.3402/fnr.v59.27912. [PubMed: 26058751]. 12. World Health Organization (WHO) . WHO Anthro 3.2.2. Geneva: Department of Nutrition, World Health Organization; 2011. Available from: http://www.who.int/childgrowth/software/en/.